American Tet enters into the lives and world of a military family, the Krombachers. The father, Jim, served in Vietnam before building a career in the Army; while the son, Danny, currently serves as a military policeman in Iraq. And then there is Elaine, an exemplary military wife and mother – an upright patriot who teaches the spouses of new soldiers the ins and outs of military life. The family, including the rebellious daughter, Amy, await Danny who is coming home on leave. Danny’s return brings unexpected complications into the black and white world of duty and pride. Coming home, too, is Danny’s friend, Angela, who has been gravely injured in the war. Meanwhile, Elaine encounters a woman from another world, Nhu, – from Vietnam – who unsettles her and sets about the unraveling of her unquestioned assumptions and world. 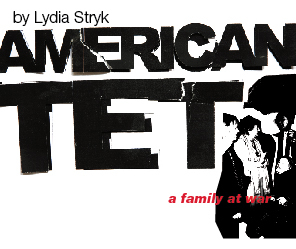 American Tet is a brutal account of the effect of the current war in Iraq and past wars, on soldiers and soldiers’ families. What´s important? Who is right? How does terror begin and most of all ­ why? born in DeKalb, Illinois, trained to be an actress at the Drama Centre, London, later studied history, education and journalism. She has a BA in History from Hunter College, an MA in Journalism from NYU and a Ph.D. in Theatre from the Graduate Centre of the City University of New York. born in Giessen; studied film directing at Deutsche Film- und Fernsehakademie Berlin. He has studied with Martin Scorsese and Mike Newell. His first feature film was Heimatfilm with Fritzi Haberland. He has directed plays by David Mamet and Georg Büchner for Vagantenbühne; movie and TV acting included Baader, and Der letzte Zeuge. He lives in Berlin and teaches film in Kapstadt and Berlin.